この概要は、使用する方法を説明します、 Windows Presentation Foundation (WPF)Windows Presentation Foundation (WPF) Geometryクラス図形を記述します。This overview describes how to use the Windows Presentation Foundation (WPF)Windows Presentation Foundation (WPF) Geometry classes to describe shapes. このトピックでは、間の相違点も対照的です。GeometryオブジェクトとShape要素。This topic also contrasts the differences between Geometry objects and Shape elements. Geometryクラスとクラスなど、そこから派生するEllipseGeometry、 PathGeometry、およびCombinedGeometry、2-d 図形のジオメトリを記述できます。The Geometry class and the classes which derive from it, such as EllipseGeometry, PathGeometry, and CombinedGeometry, enable you to describe the geometry of a 2-D shape. これらの幾何学的な記述には、画面を塗りつぶす図形を定義したり、ヒット テストやクリップ領域を定義するなど、多くの用途があります。These geometric descriptions have many uses, such defining a shape to paint to the screen or defining hit-test and clip regions. ジオメトリを使用して、アニメーション パスを定義することもできます。You can even use a geometry to define an animation path. Geometry 四角形や円、複合では、2 つ以上のジオメトリ オブジェクトから作成など、オブジェクトは、単純なできます。objects can be simple, such as rectangles and circles, or composite, created from two or more geometry objects. 使用してより複雑なジオメトリを作成することができます、PathGeometryとStreamGeometry円弧や曲線を記述するためのクラス。More complex geometries can be created by using the PathGeometry and StreamGeometry classes, which enable you to describe arcs and curves. Geometryの種類は、 Freezable、Geometryオブジェクトは、いくつかの特別な機能を提供: と宣言されているリソース、複製すると、パフォーマンスを向上させるために読み取り専用の複数のオブジェクト間で共有とスレッド セーフに行われます。Because a Geometry is a type of Freezable, Geometry objects provide several special features: they can be declared as resources, shared among multiple objects, made read-only to improve performance, cloned, and made thread-safe. によって提供されるさまざまな機能の詳細についてはFreezable、オブジェクトを参照してください、 Freezable オブジェクトの概要します。For more information about the different features provided by Freezable objects, see the Freezable Objects Overview. GeometryとShape2-d 図形が記述で、クラスが似て (比較EllipseGeometryとEllipseなど) が重要な違いがあります。The Geometry and Shape classes seem similar in that they both describe 2-D shapes (compare EllipseGeometry and Ellipse for example), but there are important differences. 1 つは、Geometryクラスから継承、Freezable時に、クラス、Shapeクラスから継承FrameworkElementします。For one, the Geometry class inherits from the Freezable class while the Shape class inherits from FrameworkElement. 要素であるためShapeオブジェクトが自身をレンダリングし、レイアウト システムに参加中にGeometryオブジェクトことはできません。Because they are elements, Shape objects can render themselves and participate in the layout system, while Geometry objects cannot. Shapeオブジェクトよりもより簡単に使用可能なGeometryオブジェクト、Geometryオブジェクトは汎用性が高まります。Although Shape objects are more readily usable than Geometry objects, Geometry objects are more versatile. 中に、Shapeオブジェクトは 2-d グラフィックスをレンダリングするために使用するGeometryオブジェクトは、2 D グラフィックスの幾何学的領域の定義、クリッピング用の領域を定義または例のヒット テスト用の領域を定義するために使用できます。While a Shape object is used to render 2-D graphics, a Geometry object can be used to define the geometric region for 2-D graphics, define a region for clipping, or define a region for hit testing, for example. 1 つShape、Pathクラスを使用して実際には、Geometryその内容を記述します。One Shape, the Path class, actually uses a Geometry to describe its contents. 設定して、Dataのプロパティ、Pathで、Geometry設定とそのFillとStrokeプロパティを表示するには、 Geometry。By setting the Data property of the Path with a Geometry and setting its Fill and Stroke properties, you can render a Geometry. これまでのセクションでは、図形の描画、アニメーション、クリッピングなどのさまざまな目的で、ジオメトリ オブジェクトを他のオブジェクトと共に使用できることを説明しました。The preceding sections mentioned that Geometry objects can be used with other objects for a variety of purposes, such as drawing shapes, animating, and clipping. 次の表に、いくつかのクラスを使用するプロパティを持つ、Geometryオブジェクト。The following table lists several classes that have properties that take a Geometry object. すべてのジオメトリの基底クラスは抽象クラスGeometryします。The base class for all geometries is the abstract class Geometry. クラスから派生するクラス、Geometryクラスを大まかに 3 つのカテゴリ分類: 単純なジオメトリ、パス ジオメトリ、および複合ジオメトリ。The classes which derive from the Geometry class can be roughly grouped into three categories: simple geometries, path geometries, and composite geometries. 単純なジオメトリ クラスLineGeometry、 RectangleGeometry、およびEllipseGeometry線、四角形や円などの基本的な幾何学的図形の作成に使用されます。Simple geometry classes include LineGeometry, RectangleGeometry, and EllipseGeometry and are used to create basic geometric shapes, such as lines, rectangles, and circles. ALineGeometry行と終点の始点を指定することによって定義されます。A LineGeometry is defined by specifying the start point of the line and the end point. ARectangleGeometryを定義して、Rect構造の相対的な位置、高さ、および幅を指定します。A RectangleGeometry is defined with a Rect structure which specifies its relative position and its height and width. 角丸四角形を作成するには設定して、RadiusXとRadiusYプロパティ。You can create a rounded rectangle by setting the RadiusX and RadiusY properties. EllipseGeometry中心点、x 半径と y 半径によって定義されます。An EllipseGeometry is defined by a center point, an x-radius and a y-radius. レンダリングとクリッピング用の単純ジオメトリの作成方法を次の例に示します。The following examples show how to create simple geometries for rendering and for clipping. 使用して、これらと同じ図形は、だけでなく、複雑な図形を作成できる、PathGeometryまたは geometry オブジェクトを合わせてがこれらのクラスを組み合わせることで、これらの基本的な幾何学的図形を生成するため簡単な手段を提供します。These same shapes, as well as more complex shapes, can be created using a PathGeometry or by combining geometry objects together, but these classes provide a simpler means for producing these basic geometric shapes. 次の例を作成してレンダリングする方法を示しています、LineGeometryします。The following example shows how to create and render a LineGeometry. 以前は、説明したように、Geometryオブジェクトができないため、この例では、それ自体を描画するために、Path図形、線を表示するためにします。As noted previously, a Geometry object is unable to draw itself, so the example uses a Path shape to render the line. 設定する行に領域があるないため、Fillのプロパティ、Pathは効果がありません。 代わりに、のみ、StrokeとStrokeThicknessプロパティが指定されてです。Because a line has no area, setting the Fill property of the Path would have no effect; instead, only the Stroke and StrokeThickness properties are specified. この例からの出力を次の図に示します。The following illustration shows the output from the example. 次の例を作成してレンダリングする方法を示しています、EllipseGeometryします。The next example shows how to create and render an EllipseGeometry. 例のセット、CenterのEllipseGeometryポイントに設定されている50,50x 半径と y 半径が両方とも設定50直径が 100 の円を作成します。The examples sets the Center of the EllipseGeometry is set to the point 50,50 and the x-radius and the y-radius are both set to 50, which creates a circle with a diameter of 100. この場合、Path 要素の Fill プロパティの値を割り当てることで、楕円の内部を塗りつぶすGoldします。The interior of the ellipse is painted by assigning a value to the Path element's Fill property, in this case Gold. この例からの出力を次の図に示します。The following illustration shows the output from the example. 次の例を作成してレンダリングする方法を示しています、RectangleGeometryします。The following example shows how to create and render a RectangleGeometry. 位置と四角形のディメンションがによって定義、Rect構造体。The position and the dimensions of the rectangle are defined by a Rect structure. 位置は 50,50、高さと幅は両方とも 25 で、正方形が作成されます。The position is 50,50 and the height and width are both 25, which creates a square. この例からの出力を次の図に示します。The following illustration shows the output from the example. 次の例は、使用する方法を示します、EllipseGeometryイメージのクリップ領域として。The following example shows how to use an EllipseGeometry as the clip region for an image. Imageでオブジェクトが定義されている、 Width 200 とHeight150。An Image object is defined with a Width of 200 and a Height of 150. EllipseGeometryで、RadiusX値が 100 のRadiusY75 の値とCenterが 100, 75 の値に設定されて、Clipイメージのプロパティ。An EllipseGeometry with a RadiusX value of 100, a RadiusY value of 75, and a Center value of 100,75 is set to the Clip property of the image. イメージの楕円の領域内の部分だけが表示されます。Only the part of the image that is within the area of the ellipse will be displayed. この例からの出力を次の図に示します。The following illustration shows the output from the example.
' Create the image to clip.
' 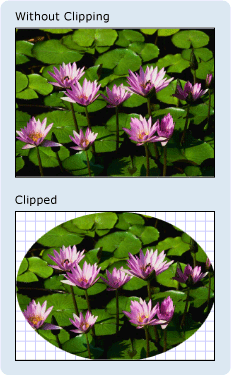 Use an EllipseGeometry to define the clip region. PathGeometryクラスとその軽量等価、StreamGeometryクラス、円弧、曲線、および行ので構成される複数の複雑な図形を記述するための手段を提供します。The PathGeometry class and its light-weight equivalent, the StreamGeometry class, provide the means to describe multiple complex figures composed of arcs, curves, and lines. 中核をPathGeometryのコレクションであるPathFigureオブジェクト、各図形で個別の図形を記述するため、この名前が付いて、PathGeometryします。At the heart of a PathGeometry is a collection of PathFigure objects, so named because each figure describes a discrete shape in the PathGeometry. 各PathFigure自体は 1 つ以上ので構成されますPathSegmentオブジェクト、それぞれの図形のセグメントをについて説明します。Each PathFigure is itself comprised of one or more PathSegment objects, each of which describes a segment of the figure. 多くの種類のセグメントがあります。There are many types of segments. ArcSegment 2 つの点を結ぶ楕円の円弧を作成します。Creates an elliptical arc between two points. 楕円の円弧を作成する。Create an Elliptical Arc. BezierSegment 2 つの点を結ぶ 3 次ベジエ曲線を作成します。Creates a cubic Bezier curve between two points. 3 次ベジエ曲線を作成する。Create a Cubic Bezier Curve. PolyBezierSegment 一続きの 3 次ベジエ曲線を作成します。Creates a series of cubic Bezier curves. 参照してください、PolyBezierSegmentの種類 ページ。See the PolyBezierSegment type page. PolyLineSegment 一続きの直線を作成します。Creates a series of lines. 参照してください、PolyLineSegmentの種類 ページ。See the PolyLineSegment type page. PolyQuadraticBezierSegment 一続きの 2 次ベジエ曲線を作成します。Creates a series of quadratic Bezier curves. 参照してください、PolyQuadraticBezierSegmentページ。See the PolyQuadraticBezierSegment page. QuadraticBezierSegment 2 次ベジエ曲線を作成します。Creates a quadratic Bezier curve. 2 次ベジエ曲線を作成する。Create a Quadratic Bezier Curve. 内のセグメントをPathFigureされて次のセグメントの始点、各セグメントの終点の 1 つの幾何学図形に結合されます。The segments within a PathFigure are combined into a single geometric shape with the end point of each segment being the start point of the next segment. StartPointのプロパティをPathFigure最初のセグメントの描画元となるポイントを指定します。The StartPoint property of a PathFigure specifies the point from which the first segment is drawn. 後続の各セグメントは、前のセグメントの終点から始まります。Each subsequent segment starts at the end point of the previous segment. 垂直線など10,50に10,150を設定して定義できます、StartPointプロパティを10,50を作成して、LineSegmentで、Pointプロパティの設定10,150。For example, a vertical line from 10,50 to 10,150 can be defined by setting the StartPoint property to 10,50 and creating a LineSegment with a Point property setting of 10,150. 次の例では、単純なPathGeometry、1 つから成るPathFigureで、LineSegment使用して、表示、Path要素。The following example creates a simple PathGeometry comprised of a single PathFigure with a LineSegment and displays it using a Path element. PathFigureオブジェクトのStartPointに設定されている10,20とLineSegmentの終点で定義されて100,130します。The PathFigure object's StartPoint is set to 10,20 and a LineSegment is defined with an end point of 100,130. 次の図は、PathGeometryこの例で作成します。The following illustration shows the PathGeometry created by this example.
' line from (10,20) to (100,130).
''' Create a PathGeometry to contain the figure. 前述のこの例はLineGeometry例。It is worth contrasting this example with the preceding LineGeometry example. 使用される構文、PathGeometryは簡単なために使用するよりもかなり詳細LineGeometryを使用する方が簡単にして、LineGeometryの冗語構文が、ここでは、クラス、PathGeometry非常に難解で複雑では、幾何学領域。The syntax used for a PathGeometry is much more verbose than that used for a simple LineGeometry, and it may make more sense to use the LineGeometry class in this case, but the verbose syntax of the PathGeometry allows for extremely intricate and complex geometric regions. 組み合わせを使用して、複雑なジオメトリを作成するPathSegmentオブジェクト。More complex geometries can be created by using a combination of PathSegment objects. 次の例では、 BezierSegment、 LineSegment、およびArcSegment図形を作成します。The next example uses a BezierSegment, a LineSegment, and an ArcSegment to create shape. 例は、まず、3 次ベジエ曲線は 4 つのポイントを定義することを作成します。 前のセグメントの終点の終了点は、始点 (Point3)、と 2 つのコントロール ポイント (Point1とPoint2)。The example first creates a cubic Bezier curve is by defining four points: a start point, which is the end point of the previous segment, an end point (Point3), and two control points (Point1 and Point2). 3 次ベジエ曲線の 2 つの制御点は磁石のように動作し、本来は直線になる部分を制御点の方へ引き寄せ、曲線を生成します。The two control points of a cubic Bezier curve behave like magnets, attracting portions of what would otherwise be a straight line towards themselves, producing a curve. 最初の制御点、 Point1、先頭に影響を与えます曲線の部分は、2 つ目のコントロール ポイントPoint2曲線の終了部分に影響します。The first control point, Point1, affects the beginning portion of the curve; the second control point, Point2, affects the ending portion of the curve. 例を追加し、 LineSegment、前述の終点の間で描画されるBezierSegment前に指定された地点をそのLineSegmentプロパティ。The example then adds a LineSegment, which is drawn between the end point of the preceding BezierSegment that preceded it to the point specified by its LineSegment property. 例を追加し、 ArcSegment、これは、上記の点から描画されますLineSegmentで指定されたポイントにそのPointプロパティ。The example then adds an ArcSegment, which is drawn from the end point of the preceding LineSegment to the point specified by its Point property. この例では、円弧の x 半径と y 半径も指定します (Size)、回転角度 (RotationAngle)、結果の円弧の角度にする必要があります大きさを示すフラグ (IsLargeArc)、円弧が描画される方向を示す値 (SweepDirection).The example also specifies the arc's x- and y-radius (Size), a rotation angle (RotationAngle), a flag indicating how large the angle of the resulting arc should be (IsLargeArc), and a value indicating in which direction the arc is drawn (SweepDirection). この例で作成した図形を次の図に示します。The following illustration shows the shape created by this example. 複数を使用して、さらに複雑なジオメトリを作成することができますPathFigure内のオブジェクトは、PathGeometryします。Even more complex geometries can be created by using multiple PathFigure objects within a PathGeometry. 次の例では、作成、PathGeometryの 2 つPathFigure複数含まれている各オブジェクトPathSegmentオブジェクト。The following example creates a PathGeometry with two PathFigure objects, each of which contains multiple PathSegment objects. PathFigure上の例とPathFigureで、PolyLineSegmentとQuadraticBezierSegment使用されます。The PathFigure from the above example and a PathFigure with a PolyLineSegment and a QuadraticBezierSegment are used. APolyLineSegmentポイントの配列で定義されて、QuadraticBezierSegment制御点と終点で定義されます。A PolyLineSegment is defined with an array of points and the QuadraticBezierSegment is defined with a control point and an end point. この例で作成した図形を次の図に示します。The following illustration shows the shape created by this example. ように、PathGeometryクラス、StreamGeometry曲線、円弧、および行を含む可能性のある複雑な幾何学図形を定義します。Like the PathGeometry class, a StreamGeometry defines a complex geometric shape that may contain curves, arcs, and lines. 異なり、PathGeometryの内容をStreamGeometryデータ バインディング、アニメーション、または変更をサポートしていません。Unlike a PathGeometry, the contents of a StreamGeometry do not support data binding, animation, or modification. 使用して、StreamGeometry複雑なジオメトリを記述する必要がある場合がデータ バインディング、アニメーション、または変更をサポートするオーバーヘッドを作成したくないです。Use a StreamGeometry when you need to describe a complex geometry but do not want the overhead of supporting data binding, animation, or modification. 、効率的であるため、StreamGeometryクラスは、装飾の記述に適しています。Because of its efficiency, the StreamGeometry class is a good choice for describing adorners. 例については、「方法 : StreamGeometry を使用して図形を作成する」をご覧ください。For an example, see Create a Shape Using a StreamGeometry. PathGeometryとStreamGeometryサポートの種類、Extensible Application Markup Language (XAML)Extensible Application Markup Language (XAML)属性構文は特殊な一連の移動を使用して、描画コマンド。The PathGeometry and StreamGeometry types support a Extensible Application Markup Language (XAML)Extensible Application Markup Language (XAML) attribute syntax using a special series of move and draw commands. 詳しくは、「パス マークアップ構文」をご覧ください。For more information, see Path Markup Syntax. 使用して複合ジオメトリ オブジェクトを作成することができます、 GeometryGroup、 CombinedGeometry、または静的なを呼び出すことによってGeometryメソッドCombineします。Composite geometry objects can be created using a GeometryGroup, a CombinedGeometry, or by calling the static Geometry method Combine. CombinedGeometryオブジェクトとCombineメソッドが 2 つのジオメトリで定義される領域を結合するブール型の操作を実行します。The CombinedGeometry object and the Combine method performs a Boolean operation to combine the area defined by two geometries. Geometry 領域がオブジェクトは破棄されません。objects that have no area are discarded. 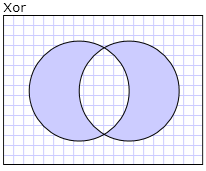 2 つだけGeometry(ただし、これら 2 つのジオメトリは複合ジオメトリの役割を果たす場合もあります)、オブジェクトを組み合わせることができます。Only two Geometry objects can be combined (although these two geometries may also be composite geometries). GeometryGroupクラスを融合したものを作成し、Geometryオブジェクトの領域を結合せずにします。The GeometryGroup class creates an amalgamation of the Geometry objects it contains without combining their area. 任意の数のGeometryオブジェクトに追加することができます、GeometryGroupします。Any number of Geometry objects can be added to a GeometryGroup. 例については、「方法 : 複合図形を作成する」をご覧ください。For an example, see Create a Composite Shape. 使用して結合操作を実行しないため、GeometryGroupオブジェクトを使用してパフォーマンスのメリットが得CombinedGeometryオブジェクトまたはCombineメソッド。Because they do not perform a combine operation, using GeometryGroup objects provides performance benefits over using CombinedGeometry objects or the Combine method. 説明したように、前のセクション、CombinedGeometryオブジェクトとCombineメソッドが含まれるジオメトリで定義される領域を結合します。The preceding section mentioned the CombinedGeometry object and the Combine method combine the area defined by the geometries they contain. GeometryCombineMode列挙型では、ジオメトリを結合する方法を指定します。The GeometryCombineMode enumeration specifies how the geometries are combined. 使用可能な値をGeometryCombineModeプロパティには: Union、 Intersect、 Exclude、およびXorします。The possible values for the GeometryCombineMode property are: Union, Intersect, Exclude, and Xor. 次の例では、CombinedGeometry共用体の結合モードで定義されます。In the following example, a CombinedGeometry is defined with a combine mode of Union. 両方Geometry1、 Geometry2 50 と <xref:system.windows.media.combinedgeometry.geometry2%2a> が、同じ半径の円として定義されます。Both Geometry1 and the Geometry2 are defined as circles of the same radius, but with centers offset by 50. 次の例では、CombinedGeometryの結合モードで定義されてXorします。In the following example, a CombinedGeometry is defined with a combine mode of Xor. 両方Geometry1、 Geometry2 50 と <xref:system.windows.media.combinedgeometry.geometry2%2a> が、同じ半径の円として定義されます。Both Geometry1 and the Geometry2 are defined as circles of the same radius, but with centers offset by 50. その他の例については、「方法 : 複合図形を作成する」と「方法 : 結合したジオメトリを作成する」をご覧ください。For additional examples, see Create a Composite Shape and Create a Combined Geometry. 継承するため、Freezableクラス、Geometryクラスがいくつかの特別な機能を提供:Geometryオブジェクトとして宣言できますXAML リソース、向上させるために読み取り専用の複数のオブジェクト間で共有パフォーマンス、複製され、スレッド セーフです。Because it inherits from the Freezable class, the Geometry class provide several special features: Geometry objects can be declared as XAML Resources, shared among multiple objects, made read-only to improve performance, cloned, and made thread-safe. によって提供されるさまざまな機能の詳細についてはFreezable、オブジェクトを参照してください、 Freezable オブジェクトの概要します。For more information about the different features provided by Freezable objects, see the Freezable Objects Overview. GetArea -の領域を取得、Geometryします。- Gets the area of the Geometry. FillContains -別のジオメトリを含むかどうかを判断しますGeometryします。- Determines whether the Geometry contains another Geometry. StrokeContains 指定するかどうかのストロークをGeometry指定したポイントが含まれています。- Determines whether the stroke of a Geometry contains a specified point. 参照してください、Geometryクラスのメソッドの完全な一覧についてはします。See the Geometry class for a complete listing of its methods.